Google's Nexus One: World-Changer or Just a Bad Idea? With major questions, like how much it will cost and how it will be sold, still unanswered, it's hard to do more than guess about whether the Google Nexus One smartphone will be widely adopted by business. But, the guess is an easy one--No. Parsing the rumors, it seems there will be two versions of the Nexus One. Google will sell an unlocked version online and there will be a domestic model that works with T-Mobile's network in the U.S.
Because unlocked phones are such a novelty in the U.S., my guess is most unlocked Nexus One handsets will be sold in foreign markets. Domestically, the phone will be sold through T-Mobile and will probably be sold just like every other phone--meaning with a carrier subsidy. That's also a guess, but I think it is a good one. Consider the other option: With only a single (or perhaps two) U.S. carriers and no carrier subsidy, Googlephone choices will be slim and the price high. When you can buy an iPhone or Droid for $199 and get Verizon or AT&T as a carrier, why would you pay twice or three times as much for a phone that works only with T-Mobile (and maybe AT&T)? And that presumes you aren't like most purely business users, effectively handcuffed to a Blackberry. Let me suggest another way this works out: T-Mobile sells the Nexus One, but the voice service as provided as VOIP by Google, meaning that customers need is a monthly data plan. That is plausible, but would seriously upset the entire wireless industry which would react by raising the cost of data service, especially when purchased without a voice plan. I will discuss this in a future post, but why don't I imagine Nexus One customers will pay less for their wireless service than what we are already paying? I have already talked about the negative impact the Nexus One may have on greater Android. I agree with those who feel open source is a mixed blessing where smartphones are concerned. The Nexus One will probably also lack good support for Microsoft Outlook users, who have played a key role in BlackBerry's enterprise and SMB success. Excellent Microsoft e-mail support is necessary for any handset to be a business best-seller. BlackBerry still has that market mostly to itself. My guess is the Nexus One, to the extent it is optimized for business users at all, will be paired to Google Apps and other Google services. 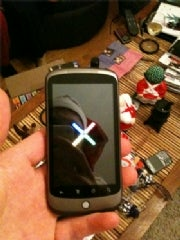 If you are one of the few, the proud, the "Gone Google," the Nexus One might be an interesting option. But, for most business users, it will be more a curiosity than something the boss might actually pay for.